With the US Federal Reserve already hinting at three-four rate hikes in 2018, another rate hike in June almost looks to be on the cards. Here are three things to know about the Fed meeting outcome. 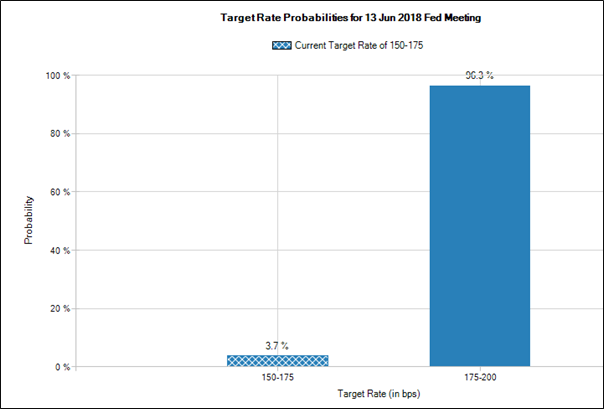 As the chart above depicts, the probability of a 25bps rate hike in the June 13 meeting is 96.3%. Of course, this is a real-time probability and keeps changing, but it almost looks unlikely that it could move meaningfully from here. That almost assumes a 25bps rate hike as a done deal. If the Fed does hike the rate on June 13, then the Fed Funds will touch the range of 1.75%-2.00%. In 2018, the Fed had hiked the rates in March but maintained status quo in May. When it comes to Fed rates, it is the future trajectory of rates that matter apart from the actual rate hike. To put that in perspective, consider the chart below which captures the movement of the Fed fund rates over time. In the aftermath of the Lehman crisis in 2008, the Fed had pushed rates down to the range of 0%-0.25% levels. That is where it stayed for over seven years till the rates were hiked by 25bps in January 2016. Since then, there have been a total of six rate hikes of 25bps each, taking the rate to the current level of 1.50%-1.75%. With the Fed already hinting at three-four rate hikes in 2018, another rate hike in June almost looks to be on the cards. Here are three things to know about the Fed meeting outcome. Broadly, the Fed relies on three key data points to take a view on whether to hike rates or not. The first is inflation. If the US CPI inflation is any indication, then the full-year inflation promises to be comfortably above the 2% mark. The Fed had originally set 2% inflation as the cut-off to consider rate hikes. With oil prices higher and consumer demand pushed by tax cuts, inflation is likely to remain at elevated levels. The second aspect is growth. Quarterly GDP growth in the US is already above 3% and the US economy looks well on target to scale beyond the World Bank estimates of 2.8% GDP growth for the US. Third, labor conditions continue to improve with the rate of unemployment falling to a low of 3.8%. In the US, 5% is considered to be representing full employment and unemployment is well below that point. That also makes a case for a rate hike in June 2018. US President Donald Trump had romped to power on the back of promises to provide a fiscal stimulus. That included a $1tn infrastructure spend and huge cuts in taxes. Both were supposed to be accretive to growth and spending and therefore inflationary. Any fiscal stimulus needs to be contained so that it does not stimulate too much inflation along with growth. The best way to contain the downside risks of the fiscal stimulus is to implement another 25bps hike. Of course, emerging market portfolio flows will largely predicate on whether the guidance is for a total of three rate hikes or four rate hikes in the year 2018. That will be the key to portfolio flows into emerging markets like India. What will a 25bps rate hike mean for India? The global markets will be keenly looking at the wordings of the US Fed meet outcome on Wednesday. For beginners, the Fed is also likely to pay 0.20% higher on the Interest on Excess Reserves (IOER) to banks. This will help the Fed Funds rate towards a lower trajectory within the range. That could actually be seen as a signal that the eventual target Fed rate may be slightly lower than what has been stated rate. That could imply that the Fed may halt at just three rate hikes this year instead of four hikes. Capital outflows into India may not be the real issue considering that RBI has already hiked rates by 25bps and the rupee has stabilized. The positive takeaway could be that a rate hike signifies the return of growth to the US and other global economies. That has typically been a lot more value accretive to the Indian markets.